Click here to learn about our professor level advisors. Click here to learn about our assistant professor level advisors. Click on a BUY NOW button (above) to pay via PayPal or credit card. After payment is submitted, we will send you a questionnaire to complete and directions on how to proceed. Clients often start working with a MedEdits medical school admissions consultant by having a personalized one hour advising session. Once registered for the service, we send the applicant a detailed questionnaire and obtain a full applicant history. Before the session we prepare by reviewing your completed questionnaire and other requested documents. During the session, we discuss topics of your choice such as academic coursework, extracurricular and scholarly interests, MCAT timing, letters of recommendation and address whatever other concerns you have. After the session you will receive written feedback summarizing what was discussed. This plan is the foundation for our future collaborative work. Whether you are years away from submitting an application or preparing to submit this summer, the best way to get started with MedEdits is by having a one hour session with us. 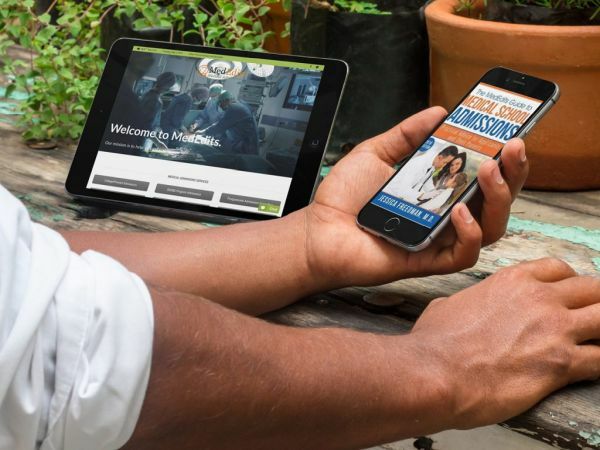 The majority of clients continue working with MedEdits after the initial session by purchasing additional advising time or choosing a application package or ongoing advising. You are ready. You want to get into medical school. 1) Submit payment and schedule a session using. 2) Complete a questionnaire and return it to us. 3) Email us additional information such as a CV, resume, rough draft of documents, prior applications. 4) Your MedEdits faculty advisor will review all of your background information before your session. 5) Meet with your MedEdits faculty advisor via phone or Skype. 6) Your MedEdits faculty advisor will send personalized written feedback within three business days. 7) Consider purchasing a long term or application package to continue working with MedEdits. 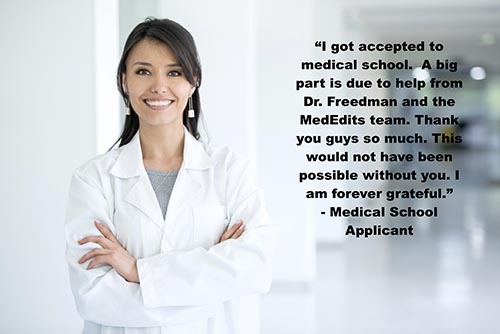 MedEdits consultants are uniquely qualified to advise premedical students and medical applicants not only because of their experience and knowledge, but because they are dedicated medical educators who are committed to helping each applicant discover his or her unique path, story, and distinguishing characteristics that can lead to success. Our advisory team collaborates frequently so each client benefits from this combined expertise. We also stay up to date with the academic medical literature, recent statistics, and data. Our unique evidenced-based advising model offers the most up to date information for our clients.